In a new book, former Romanian Lt. Gen. Ion Mihai Pacepa has revealed that anti-American Islamic terrorism was fostered by the Soviet Union to harm both the United States and Israel. According to Pacepa, the KGB spread carefully targeted disinformation in Muslim countries during the 1970s. Pacepa is the highest-ranking Soviet bloc intelligence official ever to defect to the West. Pacepa was head of Romania’s secret police and spy apparatus before receiving political asylum in the U.S. in 1978. 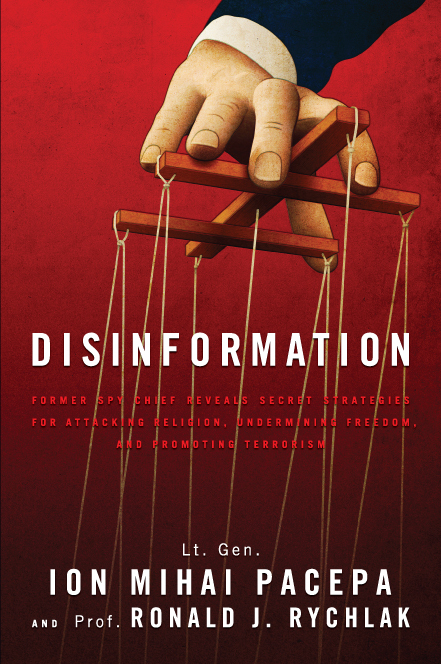 In the book Disinformation, co-written with University of Mississippi law professor Ronald Rychlak, it is revealed that as head of the KGB for 15 years, Yuri Andropov sent hundreds of agents and thousands of copies of propaganda literature to Muslim countries. Andropov would eventually become the leader of the Soviet Union. “According to Andropov, the Islamic world was a petri dish in which the KGB community could nurture a virulent strain of America-hatred, grown from the bacterium of Marxist-Leninist thought.” Andropov, according to Pacepa and Rychlak, masterminded a plot to turn Mideastern and Muslim countries against the US by inculcating the idea that the US supported a supposed Israeli plan to take over Europe. Andropov took over the KGB in 1967, a few months after Israel’s stunning defeat of Jordan and Egypt in the 1967 Six-Day War. The allies of the Soviet Union, Egypt and Syria, were humiliated. Andropov apparently decided to settle the score by training Palestinian terrorists to carry out bomb attacks as well as hijacking Israeli airline flights. Moreover, its is Andropov who commissioned the first translation into Arabic of the infamous forgery, The Protocols of the Elders of Zion, which had been distributed by Czar-era Russia in 1905 as supposed proof that Jews planned to take over Europe, with help from the US. The same book was also utilkized by Germany’s National Socialist regime in the run-up to the Second World War, as was distributed by well-known automobile tycoon and anti-Semite Henry Ford. According to Disinformation, the Protocols book was the “the basis for much of Hitler's anti-Semitic philosophy.” The KGB would later disseminate thousands of copies in Muslim countries in the 1970s. While working within Romania’s DIE spy agency, the KGB provided the Arabic translation of the Protocols of the Elders of Zion, as well as material purporting to prove that the US is a Zionist country. He was ordered to disseminate the forgery in targeted Muslim countries. Before he sought asylum in the US during the Carter administration, Pacepa said he learned that the KGB took “secret credit” for a host of terror attacks against Israeli targets. Pacepa listed eleven such incidents. Among them was the May 30, 1972 attack on Ben Gurion Airport, which left 22 dead and 76 wounded; and the July 4, 1975 bombing in ZIon Square, Jerusalem, in which 15 lost their lives and another 62 were maimed. Another issue revealed in the book is the smear campaign waged by the Soviet Union and its allies against the legacy of Pope Pius XII, the war-time pope often accused of an insufficient response to the murder of millions of Jews. In an earlier interview with Spero News, Rychlak said that Pope Pius XII was applauded by none other than Albert Einstein and Israeli Prime Minister Golda Meir for his role in helping Jews escape the clutches of the Nazis. According to Rychlak, Pius may have saved at least 500,000 Jews, some of whom he kept safe within the Vatican City and at the papal summer residence at Castel Gandolfo. For example, on June 3, 1945, Radio Moscow proclaimed that Pope Pius XII was effectively “Hitler’s Pope,” thus implicating him in the extermination of the Jews. This was counter to an address made by the pope just the day before, in which the pontiff condemned before the College of Cardinals the “satanic spectre of Nazism.” President Franklin D. Roosevelt expressed appreciation for the pope’s “assistance to the victims of racial and religious persecutions” in a public letter. Previously, Prime Minister Winston Churchill spoke of Pius XII as “the greatest man of our time.” And it was Albert Einstein who would later say, “Only the Church protested against the Hitlerian onslaught on liberty. Up till then, I had not been interested in the Church, but today I felt a great admiration for the Church, which alone has had the courage to struggle for spiritual truth and moral liberty.” Similar sentiments were also expressed by the earliest leaders of the modern state of Israel. But by the 1960s, said Rychlak, the Pope’s reputation “flipped” due to Soviet disinformation.